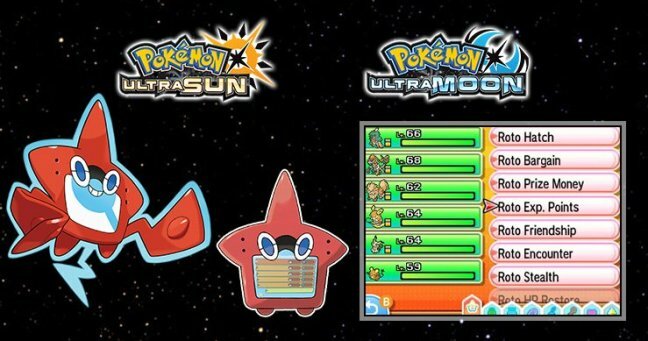 The Roto Loto, a new feature for the Roto Dex in Pokemon Ultra Sun and Moon, allows players to collect a number of benefits by bonding with Rotom. The Rotom Dex has a new feature in Pokemon Ultra Sun and Moon called the Roto Loto where Rotom will give you special items and battle boosts as your friendship with it progresses. You must talk to Rotom every once in a while to unlock the options shown in the image below. Here is a list of bonuses that you can get in the Roto Loto. This list is currently incomplete, so follow us on Twitter for regular updates in this guide. Roto Encounter Makes it easier to find a high-level Pokemon in the wild. Roto Boost Raises your Pokemon’s stats during battle. Roto Hatch decreases the number of steps you need in order to hatch an egg. This is very useful if you want to increase your Pokemon collection as fast as possible. It reduces the distance needed by 50% for 10 minutes. Other Roto Options such as Roto Boost and Roto Exp. Points can help you in leveling up your Pokemon and might also boost your EV training with the increased Exp. gain. Does the Roto Prize Money power stack with the Amulet Coin/Luck Incense? yes it does, when paired with amulet coin and roto prize money along with lets say meowths pay day, it gives you a total of I think 120,000 per battle. I only use amulet coin and roto prize money for the elite four and every battle I get 72,000. Now I feel bad taking their life savings. Roto Boost- It raises all stats of your battling Pokemon. Thanks for adding an option in our Roto Loto list! Roto Encounter doesn’t say it makes pokemon easier to catch, it says it increases the chance at encountering a high-level wild pokemon. We updated the list, thanks for correcting that!